or deeply serrated, dark green foliage. They produce tall spikes of showy flowers in late spring through to mid summer. but some hybrids are less cold hardy and others are annual or biennial plants. Delphiniums range in size from less than 2 feet tall to towering 6 ft. spikes of cup shaped blossoms. They have been favorites of gardeners for generations. 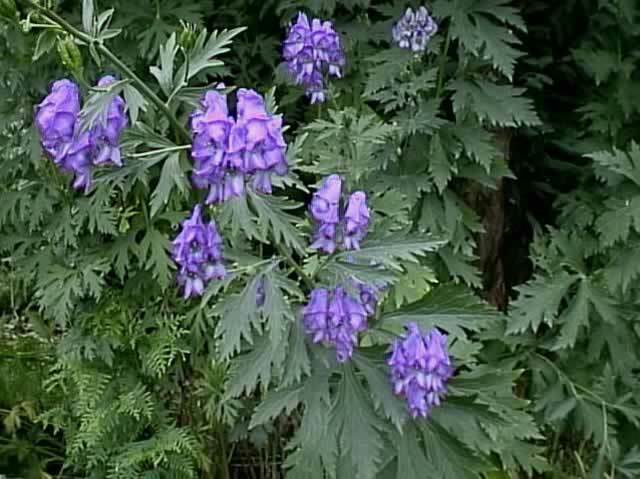 Delphiniums thrive in regions with cool, moist summers, and may languish in areas with hot, dry summers, where they are usually treated as annual plants. 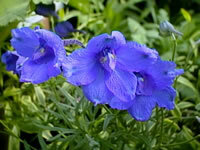 Delphiniums should be planted 1-3 ft. apart in an area with full sun to partial or light shade. They should be grown in light, sandy, well-drained, slightly alkaline soil, with a generous amount of compost added. Tall varieties should be planted in an area protected from strong winds to keep them from blowing over, or they should be supported with a stout stake. Delphinium plants should not be allowed to dry out. Water them regularly and thoroughly, but do not let water pool around the crown of the plant. Apply a balanced fertilizer every 2-3 weeks while actively growing. Apply a top dressing of compost each spring, then mulch to retain moisture and control weeds. Deadhead after flowering to prevent seed formation and encourage additional blooms. Cut back to 2" after the first killing frost. 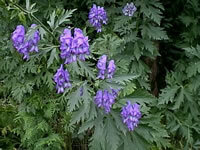 Delphiniums should be divided every three or four years in early spring, just as new growth begins to show. Softwood cuttings taken from side shoots taken from the base of the plant in early spring. Each cutting should include a small sliver of the parent crown attached at the base! Delphinium seeds require darkness for germination so cover them well. They are short lived seeds and should be used during their current season for best results. Seeds can be sown directly into the garden in early spring for first year blooms. Perennial varieties may be sown up until 2 months before the first frost, but will not bloom until the following year. 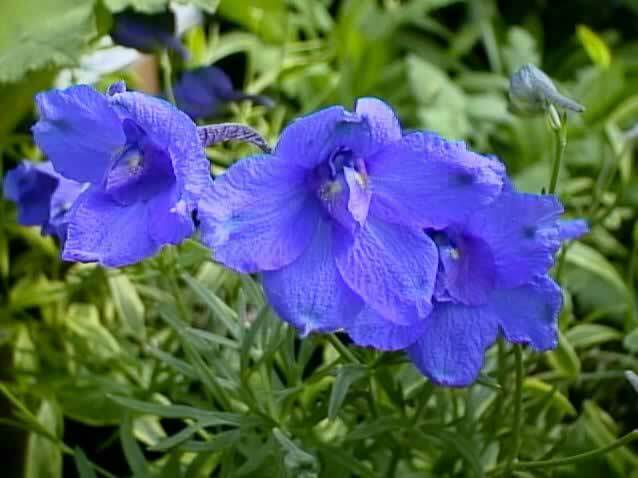 Delphinium seeds can be started indoors 6-8 weeks before the last killing frost. Maintain a temperature of 65°-75° within the growing medium. Germination will take from 8 to 15 days.